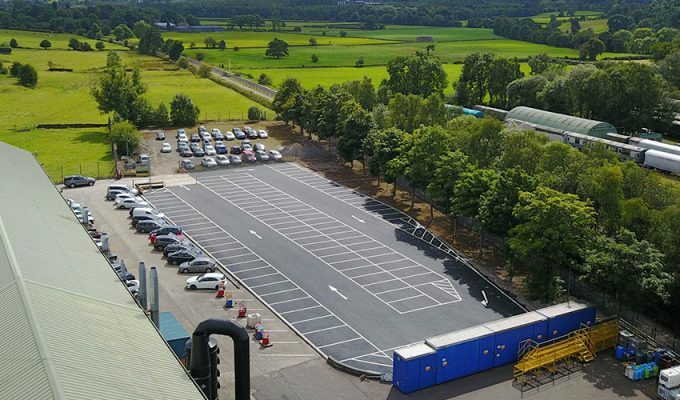 The client required the upgrade and resurfacing of their front and rear factory car parks. The scope of the works included the identification of necessary drainage upgrades within environmental regulations, as well as the reduction of gradient on the front car park, in order to allow better vehicle and pedestrian access. We began with profile planing, and then re-laid the planning to create falls as required. This served to shape up the area, in preparation for main surfacing works the following day. Levels were set out early the next morning to allow ample time for surfacing works to be completed in a single day. We provided and laid 60mm of 14mm Binder Course to the area as previously prepped, before sweeping clean the entire area to facilitate lining works. Thermoplastic line markings were then laid by hand to deliver a high quality finish. Careful allocation of parking bays led to maximising the space efficiently, as well as being aesthetically pleasing. In total, an estimated 50 percent extra of parking space was made available to the delight of our client.